Some years ago, a friend of mine said there was a zombie movie set in Manchester. Oh how I laughed at his nonsense. Then some time after that, I encountered Living Dead at the Manchester Morgue. Yes, I was the foolish one. Although the 'set in Manchester' line is still tenuous. Good news for fans of classic Hammer movies - the pick of the film posters have been officially reissued. The posters are back in print to celebrate the 50th anniversary of the release of The Curse Of Frankenstein, with 12 classic images available over a period of time. All are of the original 'quad' size, litho printed on 170gsm paper and sold in a heavy duty black glossy tube. 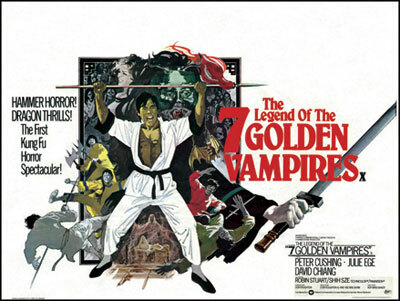 The first four of the 12 available are The Curse of Frankenstein, Countess Dracula, Vampire Circus and our favourite, The Legend Of The Seven Golden Vampires (pictured above). The remaining titles will follow over the coming weeks - and if you subscribe to buy them all, you will also receive a free copy of The Curse Of Frankenstein/The Mummy poster. This will not be sold separately. All retail for £19.99 each, with postage and packaging free to anywhere in the world. Ever wanted to make your own zombie movie? 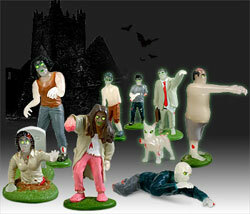 Well, now you can with this Flesh Eating Zombie Play Set. All the figures are glow in the dark, including a nice mix of grave risers, crawlers, hippies, businessmen and a particularly evil-looking dog. Just about everything you need except for a couple of survivors to terrorise - you can always use a couple of toy soldiers or a Lego man for that. Available online, the set can be yours for £14.95. 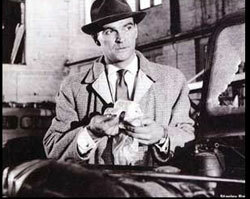 A real lost gem, with Stanley Baker as the hardened Inspector Martineau, trying to track down an escaped con who has robbed and killed since his break, whilst trying to keep his family life together. American film noir - with a northern landscape. Manchester beat kids Herman's Hermits have a dog - Mrs Brown - and it could win Herman Tully (Peter Noone) and his mates (The Hermits) some cash - if they can raise the cash to enter her into a race. So off they head from Manchester to London to make some cash as a band. Yes, it's a 60s band vehicle - but an entertaining one all the same. 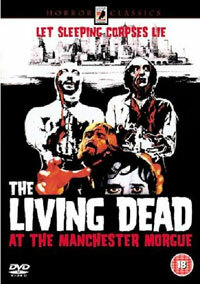 I'm not really a fan of zombie movies, but when I heard about a Spanish/Italian production set in the north of England in the 70s and with the title The Living Dead at the Manchester Morgue (aka Let Sleeping Corpses Lie), I just couldn't resist - especially with Amazon selling it for under £5 . And I'm glad I didn't. It's a lost gem, right from the opening scenes of city centre Manchester in the early 70s (it's changed, but you can still recognise much of it) and orchestral funk intro (John Dalton Street - named after a Manchester location) through to the zombie mayhem and poor-quality voice dubbing. It's cult movie central. The title is slightly misleading as most of the action takes place in the Lake District (although the filming actually took place in Derbyshire's Peak District). And it all starts with a motorbike ride. The biker is called George (Ray Lovelock), a Manchester antique dealer who is on his way to Windermere to deliver some artefacts. Unfortunately his bike gets a bump off a Mini whilst refuelling, so he's forced to take a lift off the offending Mini driver (Edna - played by Cristina Galbo). But something strange is in the air - and it's going to affect everything and everyone in the area.